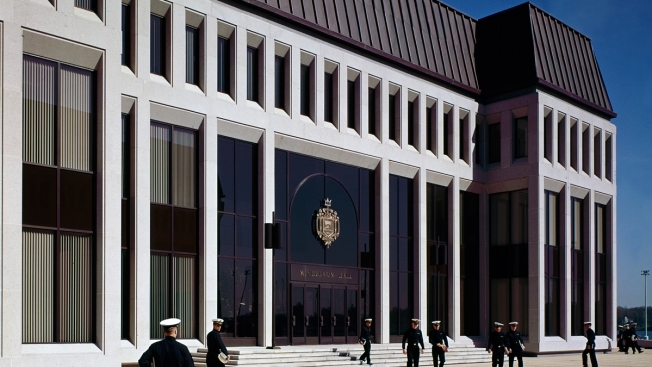 In this August 28, 2011, file photo, Michelson Hall, a building at the United States Naval Academy, is seen in Annapolis, Maryland. Nike Inc. apologized after the U.S. Naval Academy in Maryland said the similarities between a logo for a clothing line and the academy's historic seal are undeniable. The Washington Post reports the logo is a collaboration between Nike and Undefeated, a Los Angeles sportswear line. The logo and the crest both depict a shield flanked by columns. The Undefeated's shield has tally marks while the academy's has an approaching ship. In a statement, Naval Academy spokeswoman Jennifer M. Erickson said the academy appreciates Nike's decision to no longer use the logo, saying the decision is respectful of the academy, its students and alumni.